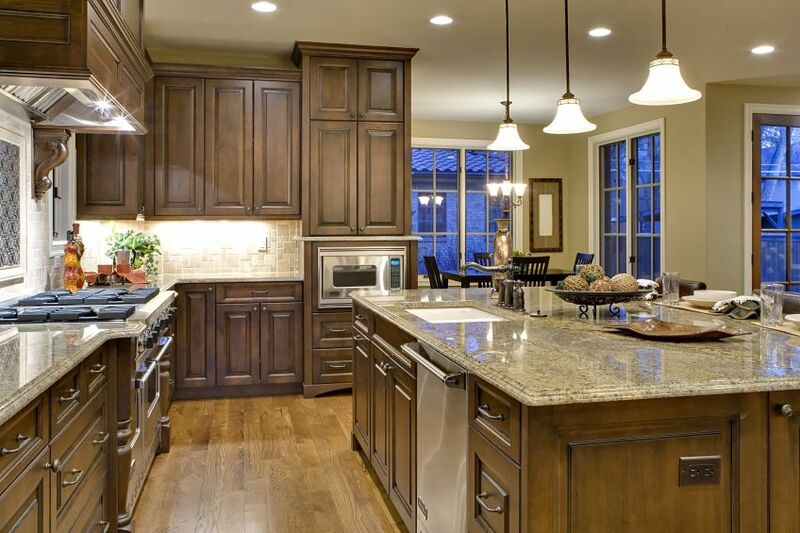 Granite is a porous stone and the degree of porosity varies depending upon the exact mineral make up of the particular granite you have selected. However, being porous does not mean that you should be unduly concerned with bacteria growth. Bacteria require several things in order to thrive and grow: oxygen, water, sunlight, nutrients, and a substrate to form on. The minerals in granite are toxic to bacteria. As a result, there is no habitable environment for the bacteria to live and grow on a granite surface. Since granite is porous there are special surface treatments available to make the surface less permeable by water and oils. This surface treatment is called a “sealer.” There are two types of sealers, topical and penetrating. Granite by Steve Moon recommends the penetrating sealer for granite countertops. Topical treatments work better on Marble or Travertine, stones that need more surface protection against scratching. Topical treatments are available in either a strippable water base or a permanent oil base. Both types are designed to sit on the very top surface of the granite and seal it against water or oil penetration. Topical treatments may make the surface of the stone darker in appearance. The topical sealer will also make the surface appear to have a higher gloss and it can be buffed. To reapply the sealer, the old sealer would have to be removed causing more effort and time to do the job. The permanent topical sealer is more problematic to remove since it is designed to be permanent but may not be depending upon use. Follow the directions of the manufacturer to remove the sealer. Since the topical sealer sits on top of the stone it prevents the stone from breathing so it is possible to trap moisture in. Granite by Steve Moon recommends a penetrating sealer that is either water or oil based and designed to be used on granite. This type sealer will penetrate the stone and reside a few millimeters below the surface in the intercrystalline boundary areas of the stone. These products do not actually “seal” the stone and are more correctly referred to as a repellant rather than a sealer. But they are commonly referred to as sealers and they do create a hydrophobic (water repellent) and oilophobic (oil repellent) barrier but this barrier is air permeable since it is not truly a sealer thus allowing the stone to breathe. There is a preference for the oil based due to its ability to penetrate deeper into the stone than the water based. But there is also an environmental consideration; the water-based products are friendlier to the environment. Either will do the job. There is no need to remove the old sealant when applying a new coating. Make certain that the sealer you select is water and oil repellant and not just “resistant.” Silicone, fluoropolymers and siloxane are commonly used in penetrating sealants. Silicone and siloxane work well in repelling water while the fluoropolymers work well in repelling oil based liquids. For application follow the directions of the manufacturer. After the recommended period of drying time wipe the surface with a clean dry cloth. Protect your countertops by never permitting anyone to stand on them. The weakest area and most susceptible to cracks is the area in front of sink and cook top cut outs. SS Construction adds reinforcing steel rods to these areas to improve the strength. However, it is a good practice to use a stepladder and not the countertop to reach high cabinets or light fixtures. As a matter of safety do not place hot pans on the granite countertop. The heat will not bother the granite but there have been instances where people place hands on the area where a hot pan was just removed from the granite causing burns. The edges of the granite are most susceptible to chipping. Just use extra care when working with utensils near the edges. Chips can be fixed, if they occur give us a call. It is worth repeating! The only thing needed to keep the surface of your granite countertop clean on a daily basis is dishwashing soap, rinsed with clean water and wiped dry with a clean dry cloth. Also, if you would not use a cleaner on your hands, don’t use it on your countertops.